Related to: Adenoviridae, Asfarviridae, Iridoviridae, Mimiviridae(? ), Phycodnaviridae(? ), Poxviridae, Tectiviridae, Phi29likevirus. Location: In host cell nucleus (Adenoviridae) or cytoplasm (Nucleo-Cytoplasmic Large DNA viruses). 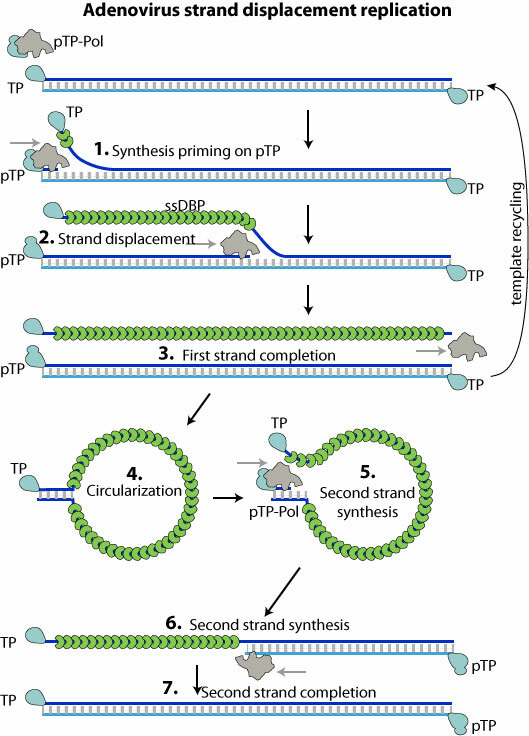 Replication events: In strand-displacement replication, only one strand is replicated at once. This synthesis releases a single stranded DNA, which is in turn copied into double strand-DNA. Adenoviridae replication is primed by a pre-Terminal Protein (pTP), Nucleo-cytoplasmic Large DNA viruses replication is primed by a repeated loop at genomic extremities and produces concatemers that are processed post-replication. Topoisomerase Pol D5 ? ? Polymerase Pol E9 ? ? Processivity factor - A20-D4 ? ? ssDNA binding ssDBP I3 ? ?